The Minnesing Trail is located on the north side of Highway 60, 23 km from the West Gate. The Minnesing Trail has four loops ranging in distance from 6 to 32 kilometres. The trail is maintained for backcountry wilderness skiing and is not groomed. Proper equipment for deep snow is required. Snowshoes are permitted on this trail. Moderate to difficult rating because this trail is ungroomed. 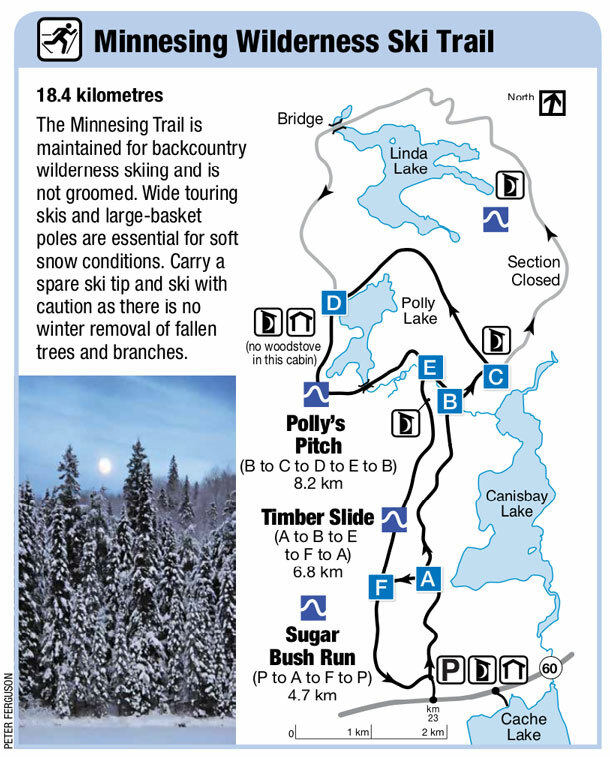 Click the image below to download the latest Minnesing Wilderness Ski Trail Map as a PDF easily opened with Adobe Acrobat or similar. Find out the latest Minnesing Wilderness Ski Trail conditions including snow depth and more.